Summary: Looking down the road, people will look to wells as their major source of water. The question now becomes—how best to remove the many contaminants living in the “ground” that affect water quality? A few options are presented here along with corresponding arguments. Although pumping water from a river or lake poses less of a mechanical challenge for municipal water suppliers, groundwater supplied from wells may become the most reliable and plentiful water source for the future. There is nearly 50 times as much water contained underground than in all the rivers and lakes combined.1 What’s more, every square inch of the Earth’s land mass has water somewhere beneath it. Groundwater is but a fraction of the salinity of the oceans. Yet, more and more localities are turning to seawater desalination to supplement their fresh water supplies. Such a luxury, costing $350 to $400 per acre foot (ac ft)—about 325,000 gallons—is simply not a universal solution. Farmers accustomed to available water at a well for under $50/ac ft may have a problem with costs as well. Although Mother Nature does an excellent job of purifying seawater via the hydrologic cycle (evaporation/condensation/precipitation), the condensing water vapor becomes contaminated the instant the water droplets form. Atmospheric gasses such as naturally occurring carbon dioxide (CO2) as well as industrial gasses containing sulfur and nitrogen dissolve and react with the water to form dilute acids—carbonic, sulfuric, nitric, (see Reaction 1). “Pure” rainwater may contain 3 to 5 ppm of these acids (and upwards of 25 ppm near large industrial cities). As these acids soak into the ground, they leach minerals from solid rock to form neutral salts. Solid marble statuary exposed to atmospheric weathering over the centuries demonstrates the aggressiveness of rainwater. Water being the universal solvent that it is, anything contained in the soil can be leached into the groundwater as soluble salt. 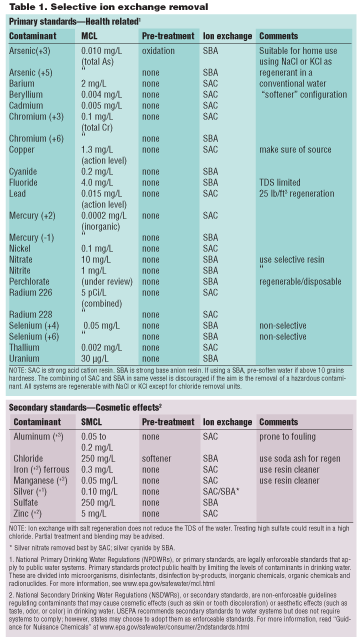 Many of these salts pose a level of toxicity associated with concentrations as low as parts per billion (ppb) levels. Iron and manganese, for example, are common constituents of groundwater. These elements are usually found as soluble bicarbonates in water but can oxidize to insoluble hydroxides or carbonates on standing, and cause unsightly staining on clothes and porcelain fixtures. Iron and manganese also have an unpleasant taste even at low levels. The U.S. Environmental Protection Agency (USEPA) has set the suggested secondary maximum contaminant level (SMCL) for iron at 0.3 ppm and manganese at 0.05 ppm. Some metals exist in their elemental or metallic form in soil and rock. Most, however, exist as oxides or crystalline salts. 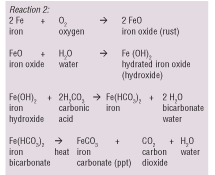 Reaction 2 shows a reaction sequence whereby iron (representing metal) is first oxidized and then attacked by rainwater and, finally, ends as a red layer of crud in the bathtub. As a general rule, metal oxides will act as (or will form) bases in water. Examples include sodium oxide (to form sodium hydroxide) and magnesium oxide (to form magnesium hydroxide). Non-metals (such as carbon, sulfur, nitrogen and chlorine) combine with oxygen in various ways and then combine with water to form acids (see examples given earlier). The acids and bases then combine to form salts and water (see Reaction 3). Iron and manganese are often associated with H2S, a gas that gives water a rotten egg smell. H2S forms acid in water and is very corrosive to metals and metal oxides. Although the presence of iron and manganese may not give rise to H2S, the presence of H2S will frequently give rise to the presence of iron and manganese. Since all natural elements are found in the Earth’s crust (and in seawater), one might assume it was the action of leaching by groundwater that transported the salt to the sea in the first place. Groundwater, therefore, can and does contain traces of all natural elements. Depending upon the make-up of the soil and aggressiveness of the groundwater, levels of metals in the water may exceed the USEPA enforceable maximum contaminant levels (MCLs) and require treatment. Many exist below current detection levels. Although it might be unusual to find these contaminants present above 1 ppm, the tolerable limits are usually in the ppb ranges. If groundwater is to become a valued font of future water resources, ways must be devised to remove these trace contaminants effectively and economically. Municipal water supplies are frequently treated with various operations including neutralization (to raise an acidic pH), oxidation (for microbiological groups), flocculation (as a means of capturing very small suspended solids), precipitation (to separate the solids from the water) and filtration (to remove the solids). By proper design, many trace level contaminants can be removed as part of these treatments. Frequently, larger municipalities have multiple sources of water that can be blended to reduce contaminants and adjust other properties. What about the little guys? Smaller municipalities and private well owners may not have the luxury of a large budget or multiple source choices. For specific ion reduction, the choices are often limited to reverse osmosis (RO) or ion exchange. If the TDS is high (above 1,000 ppm) and must be reduced, RO is often the treatment of choice. In addition to a general TDS reduction, the specific trace contaminants will be reduced as well. Untreated water can usually be blended back for economics. RO, however, produces a large waste stream that may prove difficult to discharge (it will be more concentrated in contaminants than the feed stream) without special (and expensive) post-treatment. Ion exchange, on the other hand, can be designed to selectively treat many trace contaminants independent of other ionic constituents. Ion exchange doesn’t destroy the selected contaminants but can be used to produce a concentrate—often enriched thousands of times over the raw water—for which disposal can be more easily achieved. 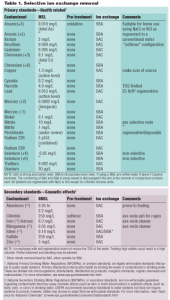 Table 1 lists common contaminants successfully removed utilizing ion exchange resins as primary treatment. Although ion exchange is not the only option, it is often the best choice because of the high specific ion selectivities of newer resins. Making the job of treating trace contaminants in well waters easier, ion exchange is re-opening wells previously closed down because of trace contaminants. Since the process lends itself to salt regenerating systems, it’s becoming the treatment of choice for residential and small municipal systems. Designers and installers should be aware of local, state or federal discharge restrictions that may limit the utility of salt-regenerated systems. Van der Leeden, Fritz, et al., The Water Encyclopedia, 2nd Ed., Lewis Publishers, 1990. Water Quality Association, Recognized Treatment Techniques for Meeting Drinking Water Regulations with the Application of Point of Use Systems, WQA, Lisle, Ill., 1993. Michaud, C.F., “Regenerable Cartridges for POU,” WC&P, March 1995.